Karamoor Estate PA Winery of the year! The 250 private acres of Karamoor Estate have been involved in farming in some form or fashion since the days of William Penn. Owners Nick & Athena Karabots decided that they they wanted to keep with the traditions of the land, and with their joy and passion of wine, made the leap to transform their land here into beautiful vineyards. Nick & Athena enjoy elegant, Bordeaux-style wines and their intention was, and continues to be, producing these types of wines in Ft. Washington, Pennsylvania. LOVE KARAMOOR MERITAGE and can't decide which award winner is your favorite vintage? Try a mixed case of three of our vintages, including our newly released 2015, James Sucking 90 POINTS recipient!! Four bottles of each vintage. 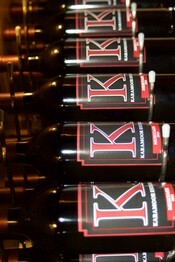 Pick it up at the winery or have it shipped for free! Wondering what to get your wine loving friends and family? Give them the gift of Karamoor!